Current Giro d'Italia leader Tom Dumoulin. 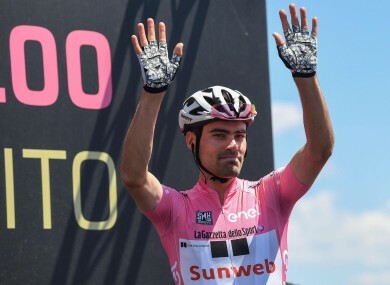 GIRO D’ITALIA LEADER Tom Dumoulin said he is determined to eclipse his embarrassing toilet mishap on stage 16 of the race by becoming the first Dutch winner of the pink jersey on Sunday. “I’m not here to write history because I’m sh*tting in the bushes. I’m here to try and write history by winning the race in Milan,” Dumoulin said today after defending his 31-second lead over Colombia’s Nairo Quintana after a 17th stage won by Frenchman Pierre Rolland. Television pictures of Dumoulin throwing his bike into a grass verge, ripping off his cycling shorts and relieving himself by the side of the road on Tuesday’s ‘Queen’ 16th stage to Bormio went viral. As well as leaving the Dutchman red-faced, it slashed his overnight lead of 2min 41secs to just 31secs after he battled valiantly over the formidable Stelvio climb into Bormio to keep the pink jersey. Today, Dumoulin avoided a repeat during a much easier 219km ride from Tirano to Canazei in the scenic Dolomites to maintain his lead on Quintana and a 1min 12sec cushion on Italy’s two-time winner Vincenzo Nibali (Bahrain). He admitted he’d learned a valuable lesson about eating before and during the race, but played down suggestions he will need to make alliances if he is to keep the double threat of Quintana and Nibali at bay. Blaming a “combination of a few things” for his toilet trouble, he said: “We have to be focused when it comes to my food intake, then we’ll solve a lot of the problem. On an 18th stage tomorrow, featuring four mountain passes, 40 kilometres of climbing and an uphill finish that will tempt his rivals into attacking throughout, he can ill afford another setback. Especially with rivals desperate to make sure Dumoulin, who crushed the field with his 10th-stage, time-trial victory, is well out of contention before the 21st and final stage time-trial from Monza to Milan on Sunday. Nibali, who lost 2.07 to Dumoulin on Stage 10′s race against the clock, suggested an alliance with Quintana’s Movistar team could be key. “When you’re racing, alliances can form, because we both have the same objective. Tom (Dumoulin) has a big advantage and he’s a victory contender for the final time trial,” said Nibali. But Dumoulin played down suggestions he could be forced to find friends in other teams willing to help his bid. “I think at the moment, alliances happen naturally because if you see today, for example, Quick Step and Team Lotto Jumbo started chasing with us, it was actually to save their own spot,” he said. Ireland’s Philip Deignan finished well down the field in 135th position today with Sam Bennett 155th of the 166 riders. Deignan remains in 44th in the general classification with sprinter Bennett back in 160th. Email “'I'm not here to write history because I'm sh*tting in the bushes, I'm here to win in Milan'”. Feedback on “'I'm not here to write history because I'm sh*tting in the bushes, I'm here to win in Milan'”.